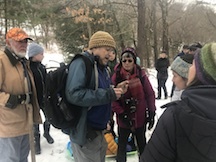 Lawrence Millman (blue jacket) leads mushroom foray in Estabrook Woods on February 3 as an alternative activity to the Super Bowl. Thoreau Farm and the Thoreau Society sponsored the 2nd Annual Super Cup Fungus Foray on Sunday, February 3, in order to provide citizens of the Commonwealth with a healthy alternative to watching a bunch of grown men smash repeatedly into each other in an event known as the Super Bowl. Cup fungi are somewhat smaller than a football stadium, but considerably more interesting. 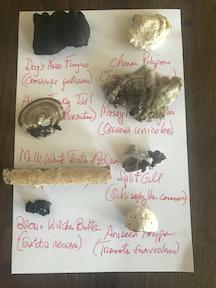 This fungi flashcard showcases some of the fungi found in Estabrook Woods during the Feb. 3 foray. We found several on the Super Cup Fungus Foray that was held in Estabrook Woods in Concord, Massachusetts. Altogether, we found 41 different fungal species — not bad for the dead of winter. Lawrence Millman is an adventure travel writer and mycologist.